While it remains highly familiar, the GranTurismo sports a number of significant changes for the 2018 model year. While it remains highly familiar, the GranTurismo sports a number of significant changes for the 2018 model year. These are more noticeable up front, where the bumper has a larger, hexagonal grille with a "shark nose" profile and a chrome frame. 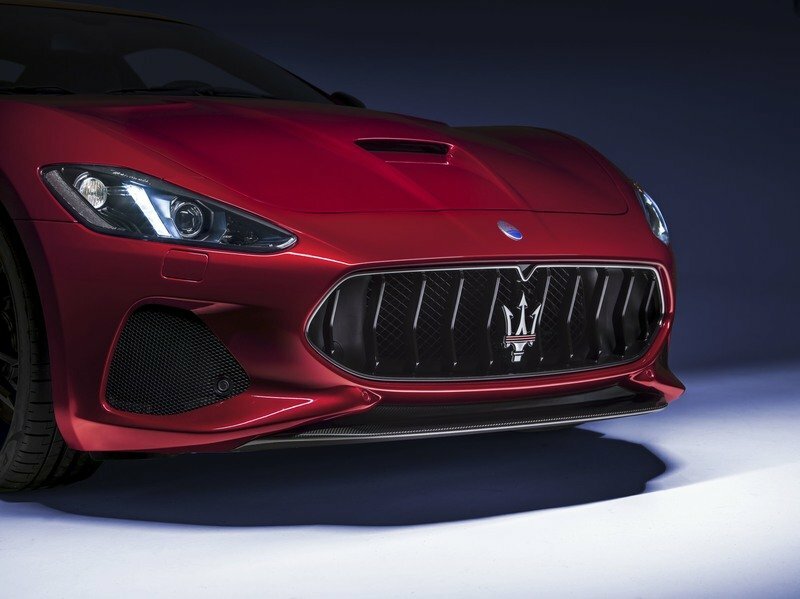 Inspired by the Alfieri Concept, this grille adds a three-dimensional effect to the front fascia, while also optimizing airflow and reducing aerodynamic drag. The side vents have also been revised for enhanced aero efficiently, while also giving the front end a more menacing look. A new central splitter was also added, with a larger element on the Mc model. Overall, the new front bumper and redesigned air splitter reduce aerodynamic drag from 0.33 to 0.32. Onto the sides, we can find new vertical air vents in the front fenders, revised side skirts, and 20-inch Trofeo Silver wheels. Maserati also restyled the headlamps, which now include reshaped LED daytime running lights, grooved housing in the Xenon lamp areas, and the Maserati inscription in low relief. Additionally, the MC version’s headlamps feature a darker finish. The MC model also gets a carbon-fiber engine hood with downforce-optimizing air vents. Onto the sides, we can find new vertical air vents in the front fenders, revised side skirts, and 20-inch Trofeo Silver wheels that are 10 percent stronger and lighter. Around back, there’s a bigger rear lip spoiler and redesigned diffusers for both the Sport and MC models. This is where the two stand out, as the Sport has oval tailpipes at the edges of the bumper, while the MC has round pipes at the center. An exterior carbon package is offered for both Sport and MC versions. 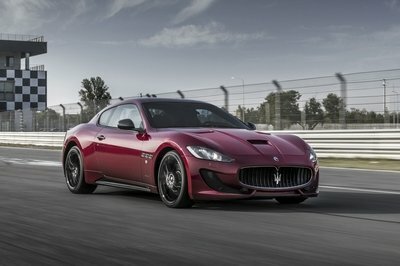 The exterior of the revised GranTurismo is available in 16 colors. A brand new three-layer hue is introduced (Blu Assoluto), while four more three-layer colors are now available on the entire range. There is a range of 14 light alloy wheels in six designs, one of which is in forged aluminium. Finally, an exterior carbon package is offered for both the Sport and MC versions, alongside new Pirelli P Zero tires. Updates include a revised center console with fewer buttons, a rotary dial, and a new 8.4-inch touchscreen. Revisions continue inside the cabin, starting with a more sculpted design of the passenger-side dashboard. 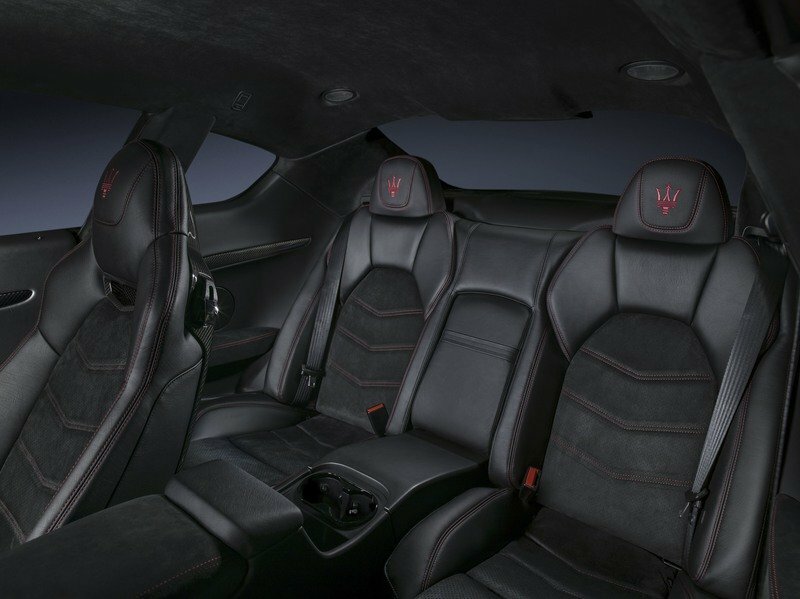 The Paltrona Frau leather seats with integrated headrests remain standard, but Maserati now offers high-fashion style stitching for the leather and Alcantara surfaces. There’s also a revised center console with fewer buttons and a rotary dial and a new 8.4-inch touchscreen for the infotainment system. Apple CarPlay and Android Auto are standard, as is the Harman Kardon Premium Sound system. For a more premium look, Maserati added a new clock with a double dial in a slightly more prominent position at the centre of the dashboard. It also equipped the grand tourer with a new rear parking camera. Customization is possible via the eight available interior colors and five interior trim options, including Carbon Fibre, Black Piano, and Walnut Briarwood. Overall, the update is far from comprehensive, but it’s quite significant for a mild facelift. And the new tech keeps the GranTurismo somewhat fresh compared to the much newer competition. 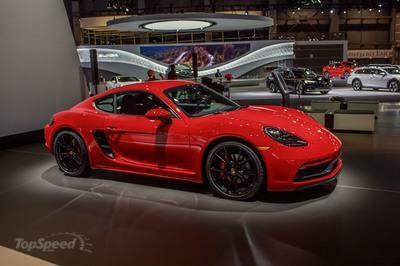 Both the Sport and the MC draw their juice from the familiar 4.7-liter V-8 co-developed with Ferrari. The big news here is that the base GranTurismo model, powered by the 4.2-liter V-8, has been discontinued. Maserati also pulled the plug on the MC Stradale, replaced by the simpler "MC" badge. Both the Sport and the MC draw their juice from the familiar 4.7-liter V-8 co-developed with Ferrari. Featuring a wet sump and a cross-plane crankshaft, the V-8 delivers the same 454 horsepower and 384 pound-feet of torque as in the outgoing model. Both versions use a six-speed ZF automatic gearbox, with no option for a manual. Performance is likely to be unchanged, so expect the Sport to hit 60 mph in 4.6 seconds, while the MC likely needs 4.4 ticks. Pricing shouldn’t change much with the upgrades, so expect the GranTurismo to start from around $134,000 in the U.S. As for the GranTurismo MC, it should retail from around $152,000 before options. The GranTurismo is old enough to be consider a classic in the grand tourer market, meaning we can compare it to another modern classic, the Aston Martin Vantage. Already 12 years old as of 2017, the Vantage isn’t exactly fresh as far as new cars go, but still has what it takes to give its competitors a run for their money. The timeless design, the well-crafted interior, and the diverse engine lineup make it a solid option. Two drivetrains are available. 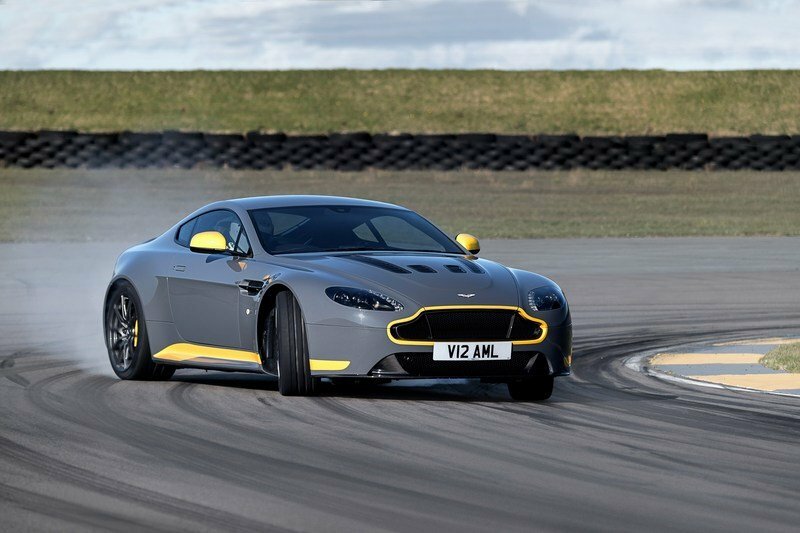 There’s a 4.7-liter V-8 rated at 430 horsepower and 361 pound-feet of torque in the V8 Vantage S and a 5.9-liter V-12 rated at 565 horses and 457 pound-feet in the V12 Vantage S. The British coupe is obviously quicker than the Maserati in V-12 guise, needing only 3.7 seconds to hit 60 mph from a standing start. But the Aston Martin is also more expensive, retailing from $190,000. 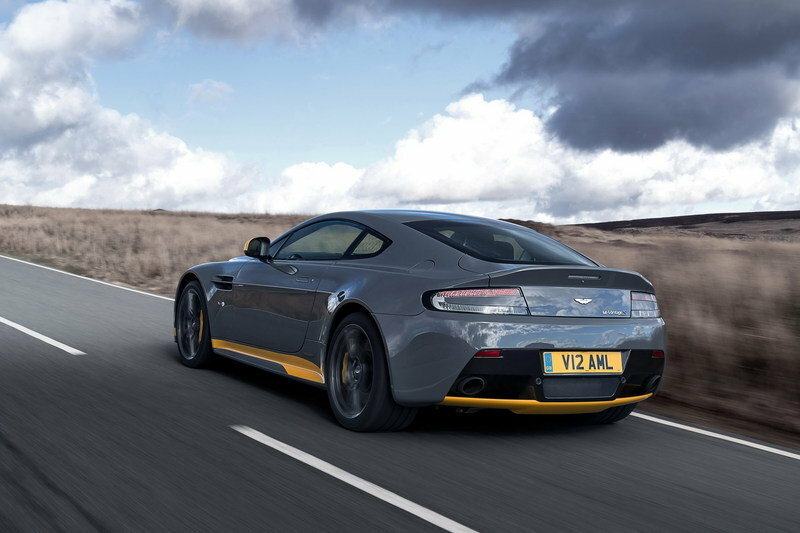 Find out more about the Aston Martin V12 Vantage S here. Introduced in 2014, the California T is a much newer proposition. And even though it’s more of a facelift to the 2008 model, it has new styling cues, an updated interior, and more importantly, a brand-new engine. 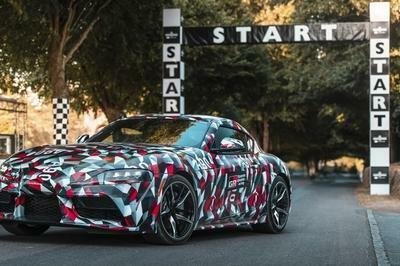 The Italians replaced the old, naturally aspirated, 4.3-liter V-8 with a twin-turbo, 3.9-liter unit and output increased to 552 horsepower and 557 pound-feet of torque. Mated to a seven-speed dual-clutch gearbox, the California T reaches 60 mph in around 3.5 seconds, to go with a top speed of 196 mph. A cool feature is that the California T is actually a hard-top convertible, meaning that you get the benefits of both the coupe and convertible body styles. 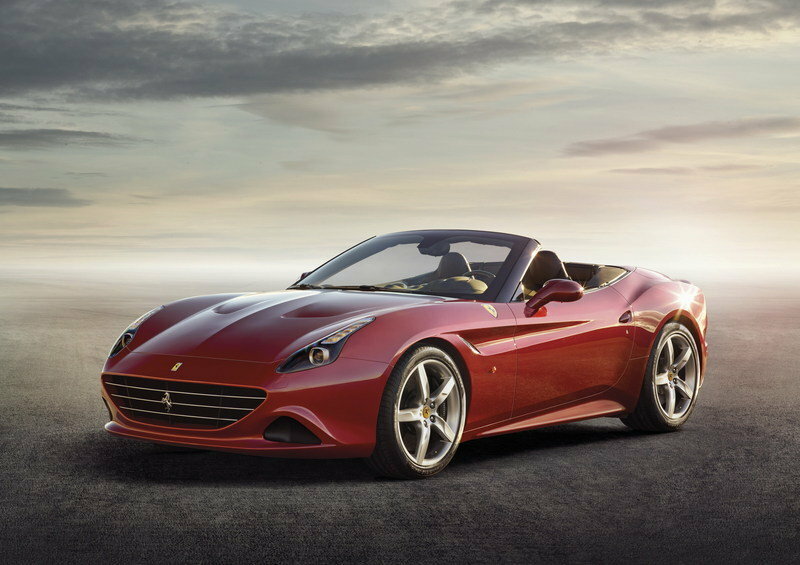 Priced from $207,000, the Ferrari California T is the most expensive vehicle in this comparison. 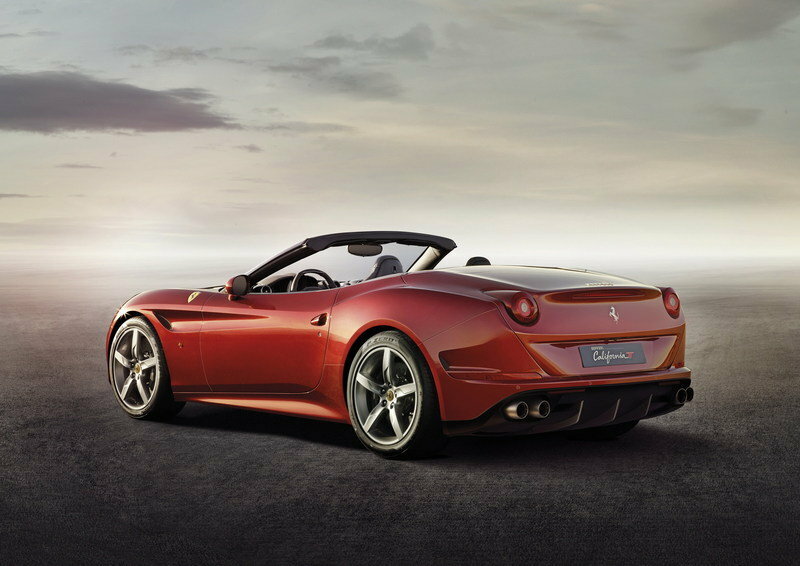 Learn more about the Ferrari California T here. With 10-year old cars considered outdated in today’s market, it’s only natural to ask yourselves why would you buy a GranTurismo. Especially with so many newer propositions available. Well, the fact is that the GranTuriso is rather unique. It’s one of the very few to still have a naturally aspirated V-8, it has a unique, race-inspired exhaust note, and to be honest, it’s still gorgeous to look at. It’s also a good way to stand out from a pack of Ferraris and Lamborghinis with a car that’s less ostentatious. The upgrades for the 2018 model year are also pretty cool, from the sportier exterior to the new technology inside the cabin. 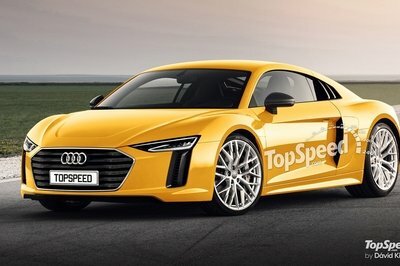 Sure, a bit of extra power would have been nice, but I guess it’s a sign that the current GranTurismo won’t be around for long. The Pininfarina-designed GranTurismo is a historically important, brand-defining model for Maserati. The luxurious four-seater sports coupé was conceived as an ultra-modern interpretation of our very first production grand tourer, the elegant Maserati A6 1500 of 1947. And over the years, the GranTurismo has evolved into one of the most iconic Maserati cars ever built, thanks to its uncompromised GT character. This character is perfectly expressed by a uniquely compelling combination – bold yet elegant design; the exhilarating, inspirational performance of a naturally aspirated, Maranello-built V8 engine; and hand-crafted comfort offered by four individual, Poltrona Frau® seats. In essence, the GranTurismo is the ultimate expression of what grand touring means to Maserati. The GranTurismo, together with its GranCabrio sibling, is assembled at the historic Maserati plant of Ciro Menotti in Modena, following the highest manufacturing and quality control standards in the world. More than 37,000 GranTurismo and GranCabrio models have been sold globally since 2007. 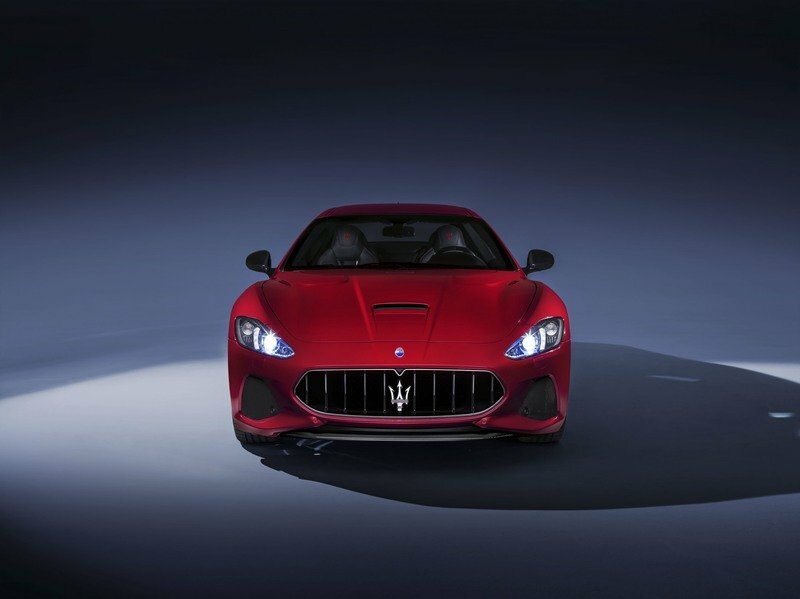 The GranTurismo range has been streamlined for 2018 and two well-defined versions will be offered – Sport and MC. The 4.2-litre GranTurismo has been discontinued, while the Sport and MC share the same powertrain and interior personalization packages. The MC – for Maserati Corse – takes on an important ambassadorial role for the entire Maserati range, representing the company’s long and illustrious racing heritage. 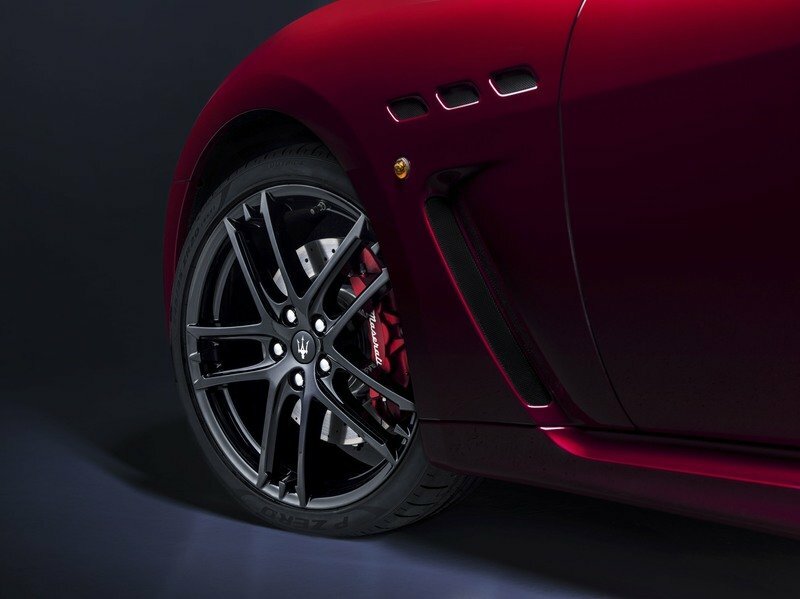 Replacing the previous MC Stradale, it offers a wide array of features already proven in other Maserati models. They include the five selectable operating modes. The naturally aspirated V8 unit is hand-assembled by Ferrari in Maranello and weighs only 175kg. 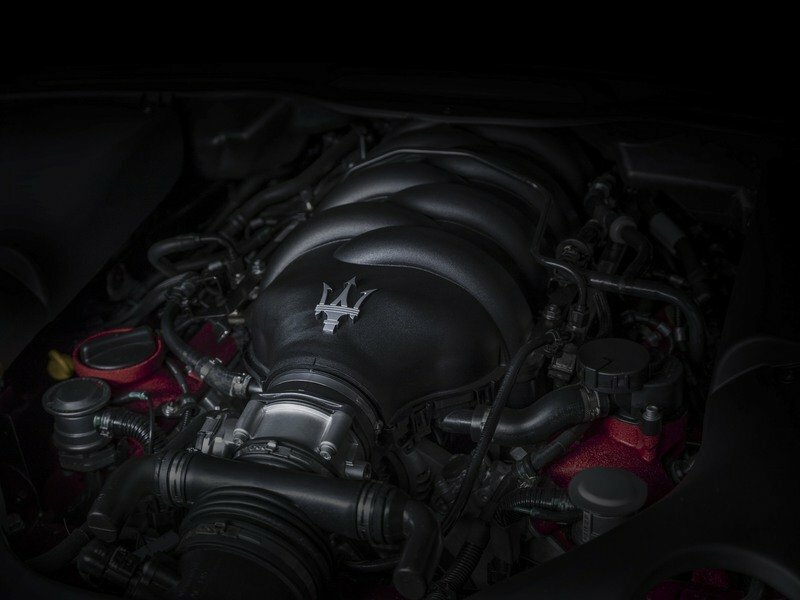 The 4.7-litre engine features a wet sump and – exclusive to Maserati – a cross-plane crankshaft. This provides unrivalled throttle response, free-revving characteristics and a thrilling Maserati signature sound. When it came to the MY18 restyle, the timeless Pininfarina design was treated with the utmost respect by the Maserati Design Centre. The results, among others, are even better aerodynamic efficiency and compliance with the latest pedestrian safety regulations. The new front and rear bumpers of the MY18 GranTurismo elegantly refine the visual impact of the striking original styling. The Sport and MC share the same basic features, although each has unique inserts to accentuate its distinctive character. Additionally, the headlights for each model are slightly restyled for 2018, while a new rear parking camera is now integrated. The front bumper features a larger, hexagonal grille with a ‘shark nose’ profile and a chrome insert all around. 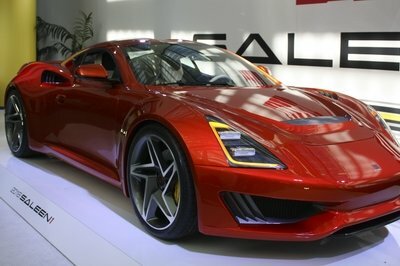 The new nose is inspired by the sensational Alfieri Concept car and adds a three-dimensional effect to the front view. This design also helps optimize airflow distribution and reduce aerodynamic drag. The bumper’s lateral air ducts, introduced in the MC Stradale and adopted across the GranTurismo range in 2012, are redesigned for 2018. By visually pushing the car’s weight towards the front wheels, they convey a heightened sense of dynamic stability, while also contributing to improved aerodynamic efficiency. The central splitter is the element that most clearly distinguishes the two models and the GranTurismo MC boasts an even more pronounced design, giving greater emphasis to the motor racing pedigree. The new front bumper and redesigned air splitter, meanwhile, reduce dynamic drag from 0.33 to 0.32. 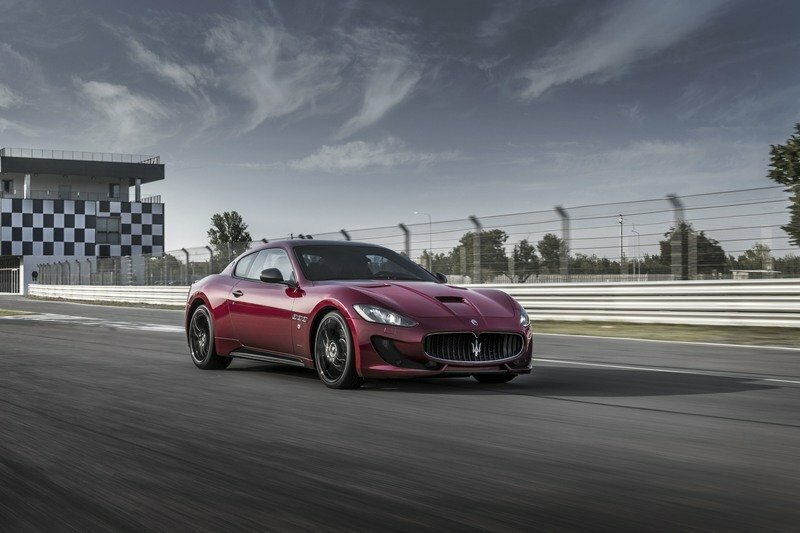 The track-focused GranTurismo MC is equipped with a carbon-fibre bonnet in the body colour as standard. The bonnet also features downforce-optimizing air-vents. Additionally, there are iconic vertical air vents in the front wings, deep functional side skirts, titanium brake calipers (black in Sport) and 20” Trofeo Silver forged wheels, now 10% stronger and lighter. A pronounced rear lip spoiler is another dynamic highlight. The headlights for 2018 maintain the same profile and LED/Bi-Xenon functionality, but feature discreet, internal restyling. This includes reshaped LED Daytime Running Lights, grooved housing in the Xenon lamp areas and the Maserati inscription in low relief. Additionally, the MC version’s headlights feature a darker finish. While the sleek body of the GranTurismo remains untouched, the rear bumper has been redesigned with the sole aim of emphasizing the natural elegance of this iconic GT. With its neater, more cohesive design, the new bumper further accentuates the impression of stability, while adding a graceful finishing touch to the car’s unmistakable silhouette. The central diffuser is specific to each version. 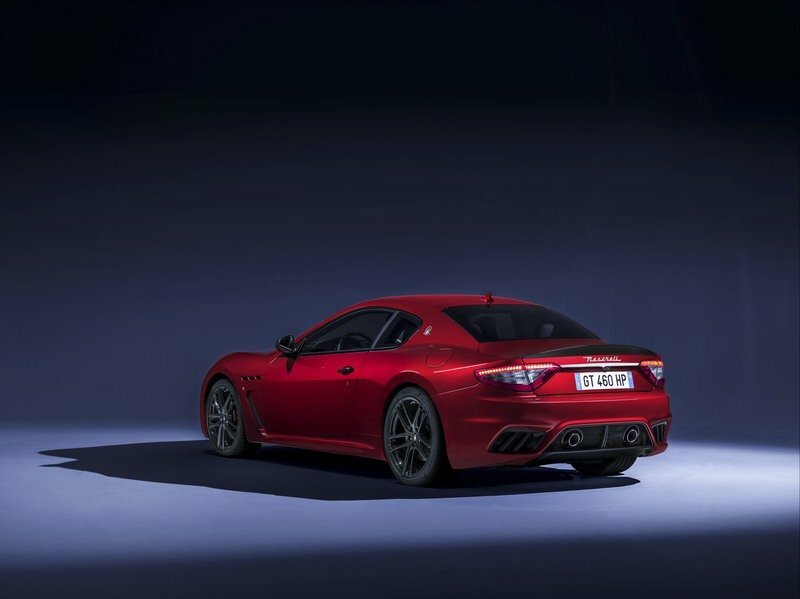 The emphasis is on elegance with the GranTurismo Sport, with the oval exhaust outlets appearing at the bumper’s edges. The GranTurismo MC is decisively sportier, with round outlets coming through the central, transparent diffuser. The exhaust system of the MC version is lighter and has a totally different shape and function. When in Sport mode, a valve channels exhaust gases so they completely bypass the silencer. This reduces back pressure and creates a breathtakingly sporty sound. The exterior of the MY18 GranTurismo is available in 16 colours. A brand new three-layer colour is introduced (Blu Assoluto), while four more three-layer colours are now available on the entire range. There is a range of 14 light alloy wheels in six designs, one of which is in forged aluminium, and an exterior carbon package is offered both for Sport and MC versions. The MY18 GranTurismo is fitted with new, lightweight, fourth-generation Pirelli P Zero™ tyres. These contribute to a reduction in unsprung weight plus better suspension performance and tyre grip. The new P Zero™ is designed to improve braking distances in dry and wet conditions, respectively by 4% and 5%, while improving mileage by at least 30%. 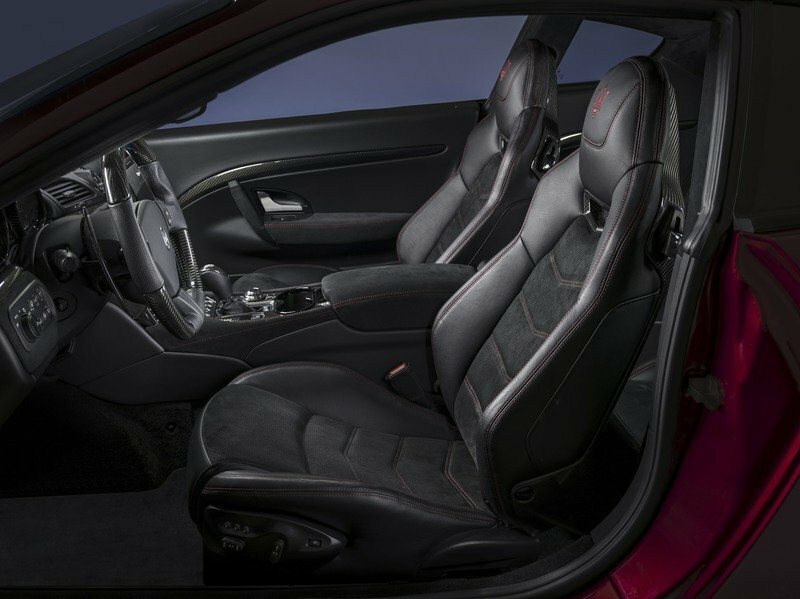 The elegant interior of the GranTurismo offers unparalleled comfort thanks to its four individual Poltrona Frau® leather seats with integrated headrests. For 2018, the dashboard features a more sculptured design in the passenger area, complemented in high-fashion style by stitched leather finishes. The centrepiece of the dashboard is now a high-resolution, 8.4” capacitive touchscreen from the state-of-the art infotainment system. 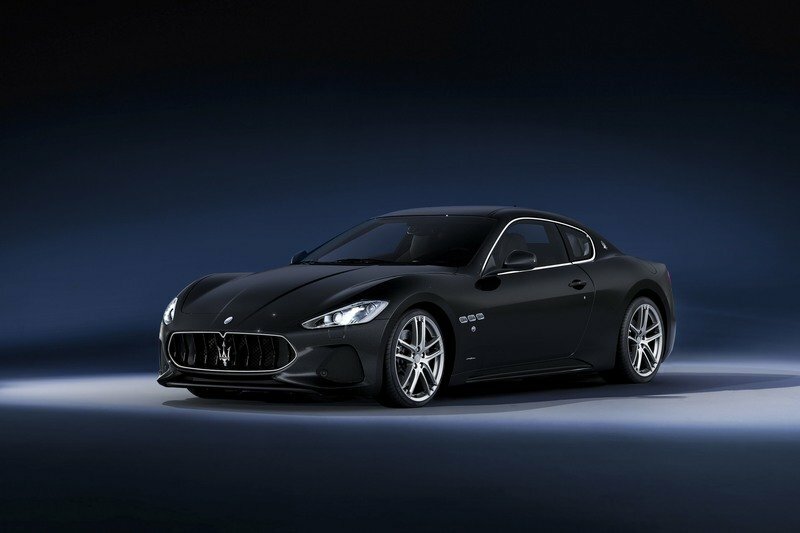 The GranTurismo system is in line with those featured in the other Maserati models and is compatible with both Apple CarPlay and Android Auto smartphone mirroring functions. Both GranTurismo models also now feature the high-end Harman Kardon Premium Sound system as standard. The climate and seat heating control are not integrated into the touchscreen function, although the central console area is still significantly neater, with fewer buttons than before. The lower console is redesigned to accommodate a user-friendly, double rotary dial – a standard feature on all Maserati models. Positioned next to the gear lever, this a high-quality component in forged aluminium. The driving modes button cluster is now in front of the gear lever. 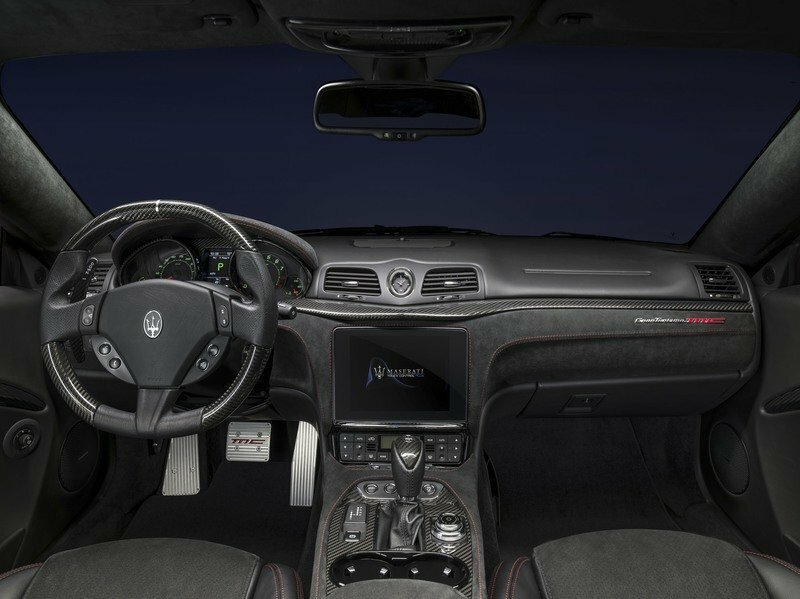 Another interior refinement is a new Maserati clock with a double dial in a slightly more prominent position at the centre of the dashboard. For 2018, there are eight interior colours and five interior trim options – from Carbon Fibre to Black Piano and Walnut Briarwood. All are available on Sport and MC versions. 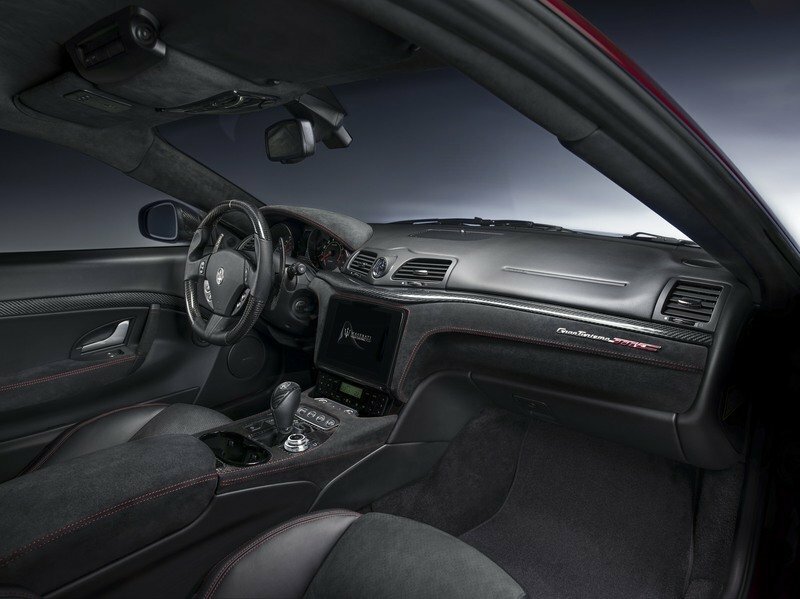 The athletic character of the GranTurismo MC is even more striking when equipped with the Poltrona Frau® leather/Alcantara upholstery (optional in the US market), gearshift paddles and drilled aluminium foot pedals. Front Sport seats with carbon fibre backs are available as an option.